Videos, examples, solutions, and lessons to help High School students learn how to identify the shapes of two-dimensional cross-sections of three-dimensional objects, and identify three-dimensional objects generated by rotations of two-dimensional objects. 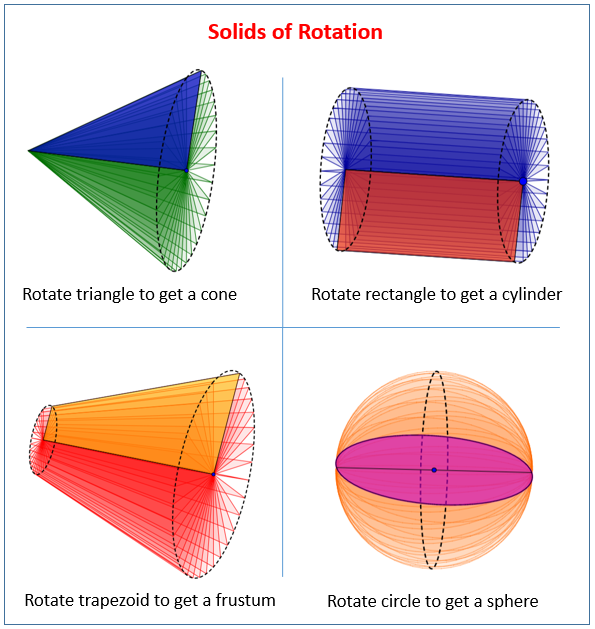 The following figures show some solids of rotation: cone, cylinder, frustum, sphere. Scroll down the page for more examples and solutions. What is the shape of the cross section of each of the following figures? Learn to identify cross sections of solids. Sketch and identify the cross section of each of the figure below. A video that shows how you can convert Figures from 2D to 3D by cross sections and rotations. Rotate a triangle to get a cone. Rotate a circle (semi-circle) to get a sphere. A solid of rotation is the three-dimensional (solid) object formed by rotating a two-dimensional area around an axis.